Serving over a million notaries nationwide since 1940, we have been assisting notaries in South Carolina for many years and have everything you will need for your South Carolina notarial practice. Tradition of Trust & Integrity Empowering South Carolina Notaries. We are your primary provider source for all your notarial and supply needs. Fax, mail, email, call or place your order online today. If you are a new or renewal notary we will expertly guide you through the entire process. We offer a full selection of discounted notary stamps, notary certificate stamps, notary impression seal embossers and supplies for South Carolina notarial services. Our South Carolina Notary Impression "Official" Seal Embossers have exceptional impression quality that leave a clear, raised and sharp impression every time. All impression seal embosser's measurements fully comply with state statutes. Our South Carolina Rectangular "Official" Seal Stamps are made of high-quality materials and have outstanding impression quality. All stamp measurements fully comply with state statutes. Our South Carolina Round "Official" Seal Stamps are made of high-quality materials and have outstanding impression quality. All stamps measure 1-1/2" in diameter and fully comply with state statutes. Submit an application containing no significant misstatement or omission of fact. Optional. Notary Service and Bonding Agency, Inc. strongly recommends that South Carolina notaries insure themselves against claims of negligence. None Required. It is strongly recommended by the South Carolina Secretary of State and Notary Service and Bonding Agency, Inc. that South Carolina notaries public record every notarial act in a notary record book. There are no automatic renewals or reminders. When reapplying, notaries must send their application at least 8-12 weeks prior to the commission expiration date. The renewal process is the same as the initial registration process, including the $25 fee. Download and complete the South Carolina notary public application and mail it along with a filing fee to the County Delegation Office in your home county. Continue here to download and complete the South Carolina notary public application. Download and complete the application according to the instructions provided. If you are a first time notary, be sure to check "new" in the top right hand corner of the application. You must sign the application in the presence of a commissioned notary public. 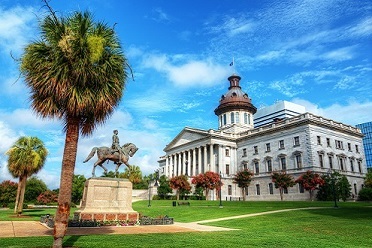 Once you have completed the top portion of the application, attach a filing fee of $25.00 via check or money order made payable to "South Carolina Secretary of State." Mail the notary public application and filing fee to the County Delegation Office in your home county for the required signatures. Your delegation office will forward your application to the South Carolina Secretary of State's office. Upon receipt of a properly executed application, the office of the South Carolina Secretary of State will mail your notary commission within one week. Once you receive your notary supplies you will be ready to begin your duties as a notary public for the State of South Carolina..